We just bought ourselves a ute. 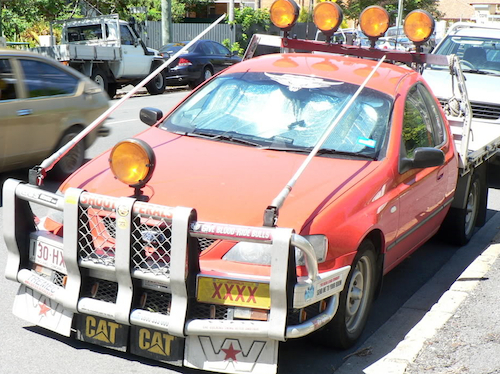 The ute is the archetypal Australian vehicle if ever there was one. 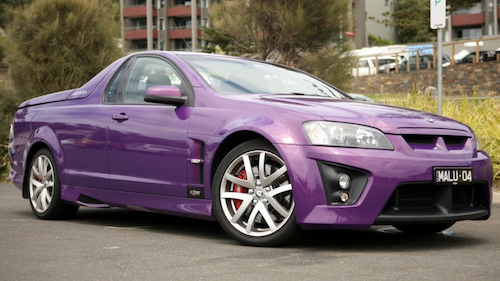 Real Aussies drive utes. While it is true that you can buy a flat-bed pickup in other countries, I doubt that anywhere outside of Australia can you equip your farm vehicle with alloy racing wheels, metallic fliptone paint jobs, lowered suspension, superchargers and turbos, or fully race-spec V8 engines. Holden (GM) and Ford even sell them fully tricked up from new, and ute racing is an enormous part of the racing calendar. Some people like to add lots of lights, aerials and unfeasibly large bullbars (known here as roo-bars). Ours doesn’t look like that, though. Ours is a twenty year old Toyota that has spent its entire life chugging around on a rural property, carrying water from the dam to the farmhouse. In this way, it has somehow clocked up an astonishing half a million kilometres, and accumulated an interesting selection of minor dents, some of which have been repaired with household gloss paint. The windows were described by the vendor as ‘manual’, in that to open and close them you put your hand against the glass and push. The radio doesn/t work very well, but it really doesn’t matter because you’d be most unlikely to hear it over the transmission whine anyway. Still, its just what we need to ferry heavy bits and pieces to and from the boat. So why mention it here? Well, I just wanted to say that it is such a pleasure to have a car that you actually have to drive, rather than allowing a bunch of electronics do it all for you. You point the bonnet in the direction that you want it to go, put it into gear, and press the accelerator. If you want to drive with the lights on, then you switch them on. When it rains, you can decide when your windscreen wipers come on, and how fast they move. If you come to a hill, you can change down, or not, depending on your mood. When you need to stop, then it is up to you to decide how hard to push the brake pedal in order to stop without locking the wheels up. If you want to turn a tight corner, then you have to use upper body strength to move the steering wheel around. It is absolutely brilliant. Bronwyn and I fight over whose turn it is to drive. This entry was posted in Australia, Oceania, Travel on 2008/04/18 by Reinhard.